No, that’s not a typo! 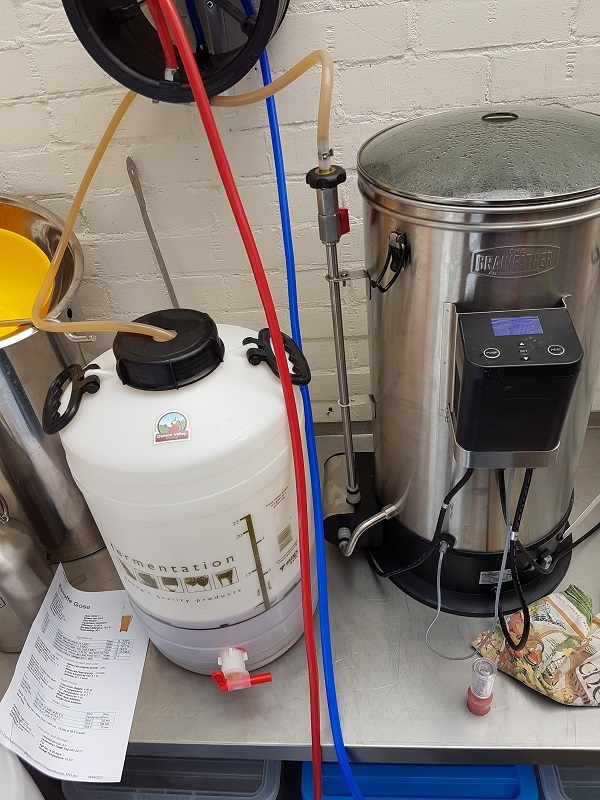 Brewday 43 took place over two separate sessions! This was my first attempt at a sour beer recipe which came to me at 3am in a flash of inspiration… a Banoffee Gose! Banana & Toffee are great together, Salted Caramel is amazing too so can these flavours be combined into one beer? The base of this beer would be a ‘proper’ kettle-soured Gose, but with the addition of some Caramalt to impart that toffee flavour. This would darken the beer slightly but hopefully not too much. The Banana would come from the Hefeweisen yeast which I would intentionally stress out and ferment at the high end of the temperature range to maximise this flavour output. On paper this seems perfectly reasonable but will it work in practice?! There’s only one way to find out! The first stage of the kettle souring process is to complete the mash as normal. Once the sparge was complete I brought the wort to the boil for 15 minutes to pasteurise it and kill off any bacteria in the wort at this point. 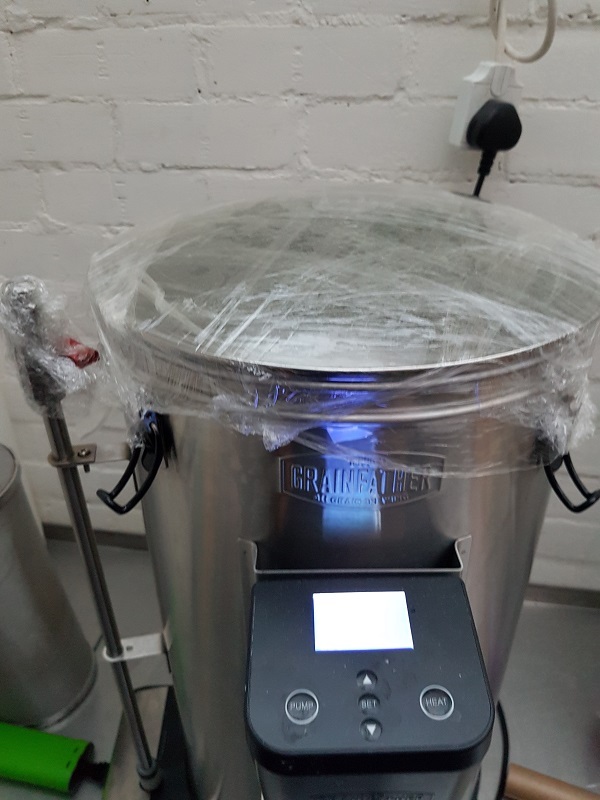 You don’t have to boil the wort like this if you are willing to risk other bacteria growing in your wort and therefore add a degree of randomness to the souring process – I wanted more control so I chose to boil! 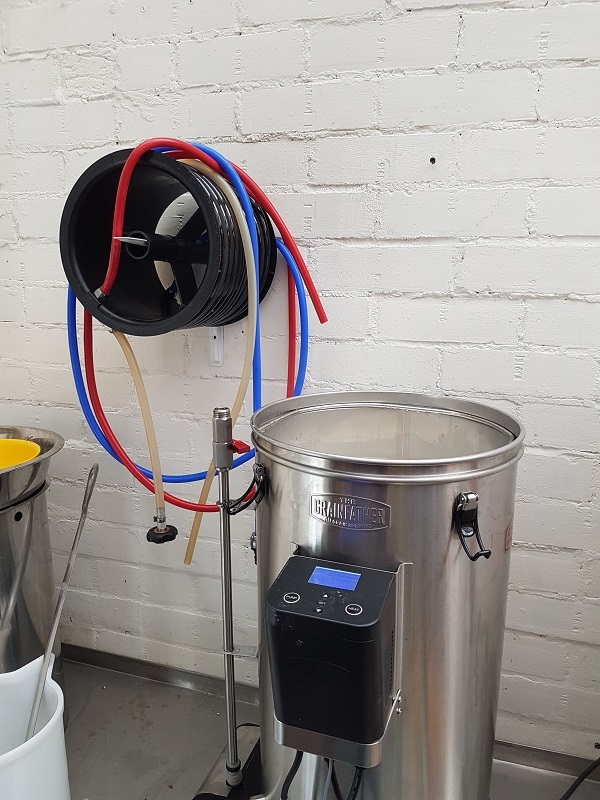 Following the mini-boil, the wort was chilled down to 28C using an immersion chiller and then held at that temperature using the Grainfather’s control unit. 48 hours earlier I had made a 1 litre starter using the Omega Lactobacillus Blend. Even though the photo shows the flask sat on one, this type of starter doesn’t need a stir-plate as it doesn’t need to be agitated to promote growth. The stirplate above was turned off! The starter was then pitched into the wort and the lid of the boiler sealed with clingfilm to keep any other passing nasties out! If you had a PH meter (and I didn’t!) now is the perfect time to take a reading! The wort PH will be around 5, and after 3 days with the Lacto Blend pitched this will have lowered to around 2 or 3. Ta-Daa! Soured wort! After the souring process is complete, the clingfilm is removed and the wort is brought to the boil for the second time! This 60 minute boil kills off the Lactobacillius cultures and stops the souring process. Hops are added to this boil but only a tiny amount is used because too many IBU’s will negate the sourness. All done! Transferring to the fermenter. Second boil completed and the wort was down to an OG of 1.048. The Hefeweisen yeast was pitched and the fermenter fridge set to 32C. 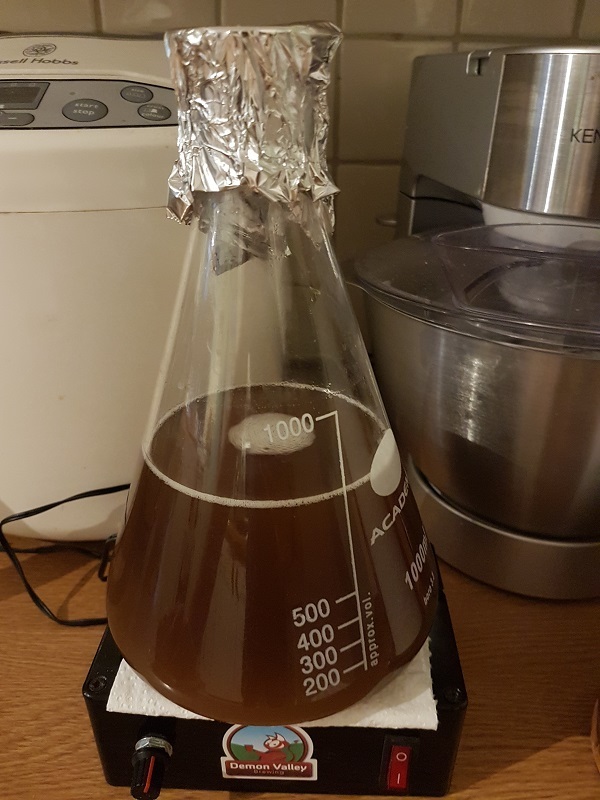 I intentionally didn’t create a starter for the yeast pitch because by under-pitching I hoped to stress the yeast even further and create even more Banana flavours!